Discussion in 'Buy / Sell / Trade' started by gz2zg, Oct 3, 2010. I have a few parts left over from a 2001 Tacoma I no longer own; yours for the cost of postage/shipping (or driving here, whatever works for you), I just want them out of my garage and in somebody's truck. 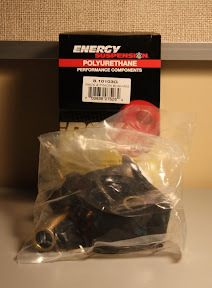 8.10103G (black) steering rack bushings, bag never opened; these fit in a USPS small flat-rate box. 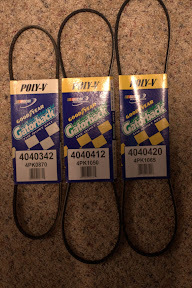 Replacement belts (V6): Goodyear Gatorback 4040342 (4PK0870), 4040412 (4PK1050), and 4040420 (4PK1065); these will probably all cram into a USPS small flat-rate box. If tigerfan doesnt get the bushings, I'll take em for the GF's truck. I am interested in the belts if no one else get them. hell yeah!!! mod day!! we'll install mine and yours, since i've been a slackass and havent put them in yet. sweet. lemme know when....i'll get the beer.